The Department offers a four year UG degree course, Bachelor of Technology in Mechanical Engineering and a two year PG degree course, M.Tech in CAD / CAM. 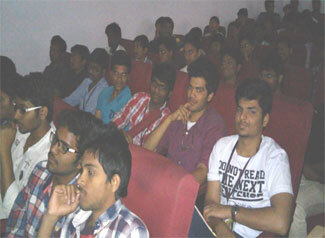 The course of B.Tech, in Mechanical Engineering was started in 1998-99, with an intake of 60. Subsequently the intake increased to 120 in the year 2007-08. 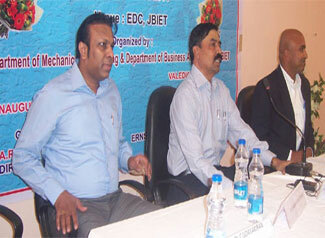 The M.Tech., in I E & M course was started in the year 2004-05 with an intake of 18. Later in the year I E & M course was replaced by CAD / CAM. 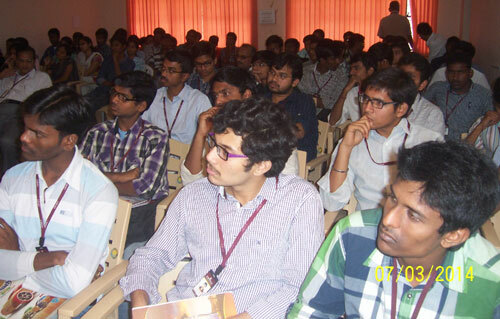 Sixteen batches of UG and ten batches of PG have successfully completed their course and in the year 2013-14. About 60% of the students have been placed in various MNCs through campus interviews, 30 % of the students have applied and pursuing higher education in reputed Institutes and Universities of India and abroad. 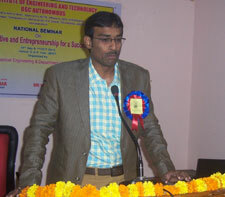 We proudly announce that students of our department have established and emerging as successful entrepreneurs. The department is well established with excellent laboratory facilities and well qualified competent Faculty (3-Ph.Ds, 6-Persuing Ph.Ds and 17 M.Techs) & senior technical staff. The BOS of the Mechanical engineering department considers inputs from Industrial and academic members to design curriculum to train the students to meet the expectations of the present industry. The Department primly concentrates to impart high Quality Technical & Professional education with the state of art of Infrastructure, state of art of laboratories, state of art of curriculum and high quality teaching in the areas of design, development using modern tools, composite materials and digitization process to cater the needs of stake holders. To nurture excellence in the field of Mechanical engineering by imparting technical core values and instruction to the learners and to mold the department into a centre for academic excellence through promoting higher education and advanced research to provide technical services at global competence. 1. To impart highest quality education to the students to build their capacity and enhancing their skills to make them globally competitive mechanical engineers and maintain state of art research facilities to provide collaborative environment that stimulates faculty, staff and students with opportunities to create, analyze, apply and disseminate knowledge. 2. To develop alliances with national level R&D organizations, educational institutions, industry and alumni for excellence in teaching, research and placements. 3. To provide the students with academic environment of excellence, leadership, ethical, social guidelines and lifelong learning needed for a long self employment career. 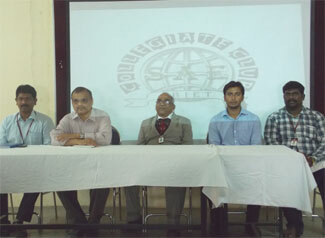 MEMBERS OF BOARD OF STUDIES MECHANICAL ENGINEERING. 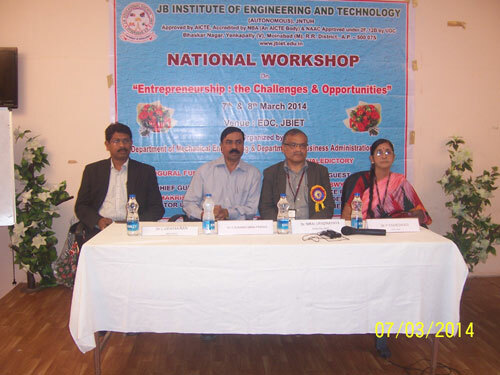 2 Days National Conference on Skill India Initiative and Entrepreneurship for a Successful India on 30-09-2015 and 01-10-2015 conducted in EDP Cell ; Dr. G.U. 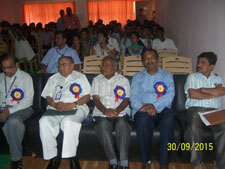 K.RAO,SHRI G. SAMPATH KUMAR and VENKAT VEDIRE acted as Resource persons. 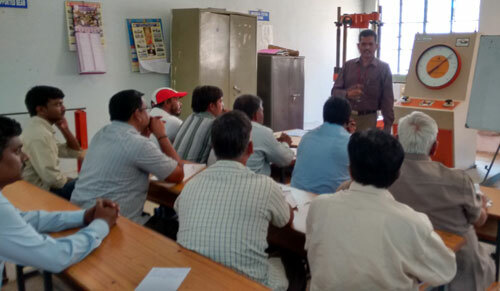 Intensive Technical Skills Development Program-1 conducted on 19-10-2015 to 21-10-2015 for Lab Technicians. 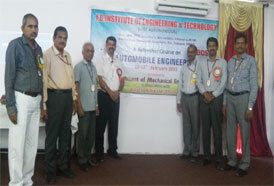 A Refresher Course on 'Automobile Engineering' on 10th Feb, 2015 is held by Department of Mechanical Engineering in MN Rao Auditorium: Mr.K.Aravind Manager Technical Traning Bosch Chennai acted as Resource person. TIER-II Event are inaugurated and conducted by SAE JBIET Collegiate Club. 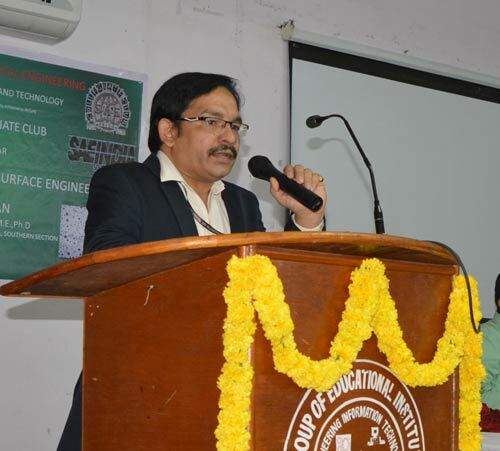 Mr.Padmanabhan Sci”G’, DMRL, SAE International Hyderabad has addressed members of SAE Chapter students on 15 Sep 2014 at EDP Cell. 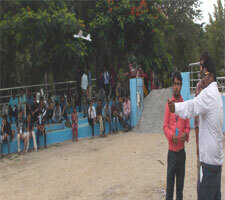 Aeromodelling, Technical Quiz, Engine assembly events were held. A One week Workshop on Automobile Dynamics & Designing is held by Elite Technogroup in MN Rao Auditorium during 15-21 July 2014. 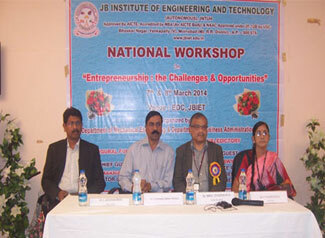 National Workshop on "Entrepreneurship: the Challenges & Opportunities" is held during 7-8th March, 2014 orgnanized by Mechanical Department in Entrepreneurship Develeopment Cell. 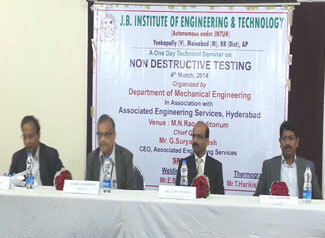 A Seminar on “Nondestructive Testing” is conducted on 4 March 2014 by Department of Mechanical Engineering in association with ASSOCIATED ENGINEERING SERVICES, Hyderabad. 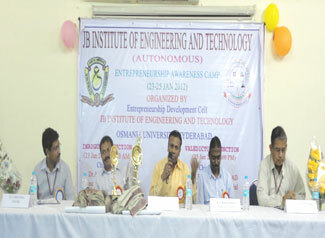 A 3-Day Entrepreneurship Development program in association with Osmania University during 9-11 Jan, 2011 in JBIET Campus. Dara Eshwar and Dr.A.C.S.Kumar: Taguchi Based Mechanical Property Optimization of Heat Treated Samples of AL – 65032 Alloy Using TIG Welding, International Journal of Materials Science (ISSN : 0973-4589), Vol. 10, No. 1 (2015), pp. 17 – 29. 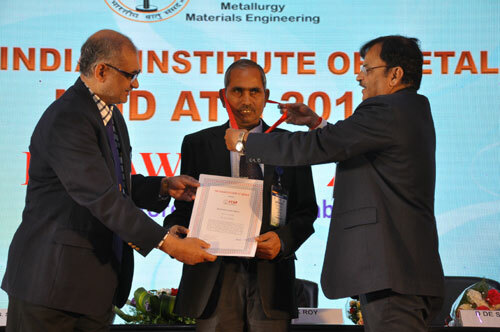 Dara Eshwar, Dr.A.C.S.Kumar and Dr.B.Koti Veera Chari : AL – 65032 Mechanical Property Optimization and Analysis of Heat Treated Samples Based on Taguchi Metal Inert Gas (MIG) Welding, International Journal of Scientific Engineering and Technology Research (ISSN : 2319 – 8885), Vol. 4, Issue No. 9, April, 2015, pp. 1630 – 1635. A.C.S. Kumar, A.K. Mehta, S.P. Dubey and U.R.K. Rao : Modelling of Grinding Wheel Life by the Group Method of Data Handling Technique together with Sensitivity Analysis, International Journal of WEAR, V 127, 1988, p. 179-191. V. Vasu, K.Rama Krishna, and A.C.S.Kumar: Exploitation of Thermal Properties of Fluids Embedded with Nanostructured Materials, International Energy Journal, Vol.8, 2007, p.181-190. V. Vasu, K.Rama Krishna, and A.C.S.Kumar: Analytical Prediction of Thermophysical Properties of Fluids embedded with Nanostructured Materials, Int. Journal of Nanoparticles, Vol.1, No.1, 2008, p. 32-48. P. Divakara Rao “Reducing Machining Time by Using Modern Manufacturing Software” International Journal of Engineering Development and Research, vol-2,issue 4,pp 3619-3626, Dec-2014. R.S.Umamaheshwar Rao, Dr. G.C.M.Reddy, Development and Thermal Characterization of Chitin Particle Reinforced Phenol Formaldehyde Composite. Institute of Engineers journal, vol. 92, 2011,pp 8-11, ISSN: 2250-248. 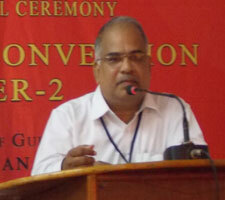 P. Seema Rani ,” static and analysis of micro drills using” , vol-6,issue-1. 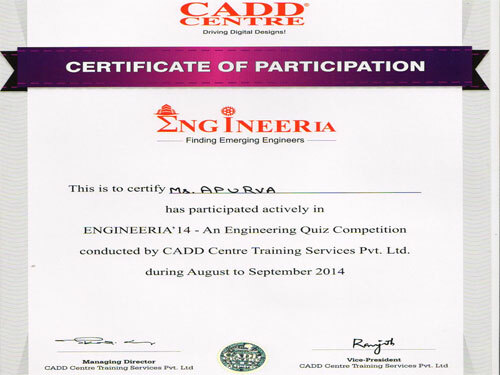 P. Seema Rani “ analysis of cabin mounting bracket of truck using ANSYS, vol-5,issue-11. “Gender Effects on Risk Propensity, Risk perceptions and Risk Taking Behaviour of Entrepreneurs- An Exploratory Analysis”,International Conference on Emerging trends in Engineering, Science and management, march 2017, 1416-1424, SBN :978-93-86171-32-0. Gender Effects on Risk Propensity, Risk perceptions and Risk Taking Behaviour of Entrepreneurs- An Exploratory Analysis, International Journal of Science Technology and management, 2017, Volume 06, Issue 03, 508-516, ISSN: 2394-1529. A Study on Entrepreneurial Inclination among students, International Journal of Emerging Research in Management and Technology, 2017, Volume 06, Issue 08, 357-362, ISSN :2278-9359. Mechanical characterization of human hair fibre reinforced polyester composite- a comparative analysis, International conference on Emerging Trends in Mechanical Engineering during 23-24 September 2016 (ICETIME 2016) , September, 92-95, ISBN: 9788131427941. Md IsrarEqubal, RajkumarOhdar, PinakiTalukdar, DebasisMukerjee “Hot forging behavior of medium carbon and microalloyed steel: A comparative study” International Journal of Microstructure and Materials Properties, Vol. 12, No. 1/2, pp. 1-11, 2017. AzharEqubal, Md. IsrarEqubal, Anoop Kumar Sood, Md. Asif Equbal “A comparative study on electroplating of FDM parts” International Journal of Technology, Vol. 8, No. 5, pp. 328- 336, 2017. AzharEqubal, Anoop Kumar Sood, M. Asif Equbal, M. IsrarEqubal “An Investigation on material removal rate of EDM process: A response surface methodology approach” International Journal of Mechanical, Aerospace, Industrial, Mechatronic and Manufacturing Engineering, Vol. 11, No. 4, pp. 845-850, 2017. ParwezAlam, Md IsrarEqubal, Avtar Krishna “Die Stress Optimization using Quantum Behaved Particle Swarm Optimization” International Journal of Mechanical and Production Engineering Research and Development, Vol. 7, No. 1, pp. 95-104, 2017. Md IsrarEqubal, ParwezAlam, RajkumarOhdar, Md SerfrazAlam “Studies on Lubrication Behavior of 35C8 Steel Using Ring Compression Test and Finite Element Simulation” International Journal of Mechanical And Production Engineering, Vol. 4, No. 11, pp. 4-8, 2016. Md IsrarEqubal, ParwezAlam, RajkumarOhdar, Kumar AniketAnand, Md. SerfrajAlam “Effect of Cooling Rate on the Microstructure and Mechanical Properties of Medium Carbon Steel” International Journal of Metallurgical Engineering, Vol. 5, No. 2, pp. 21-24, 2016. Md IsrarEqubal, RajkumarOhdar, AzharEqubal, Anoop Kumar Sood “Grey based Taguchi method for optimization of hot forging of connecting rod” International Journal of Manufacturing Research, Vol. 11, No. 1, pp. 89-109, 2016. PinakiTalukdar, RajKumarOhdar, Balbir Singh, Md IsrarEqubal “Optimization of process parameters in hot forging of medium carbon micro-alloyed steel” Applied Mechanics and Materials, Vols. 813-814, pp. 563-568, 2015. AzharEqubal, Md. IsrarEqubal, RajkumarOhdar “Isothermal Forging of Ti-6Al-4V Alloy - Flow Stress Evaluation and Optimization” International Journal of Scientific Research in Science, Engineering and Technology, Vol. 1, No. 5, pp. 235-238, 2015. RajkumarOhdar, PinakiTalukdar, Md. IsrarEqubal “Evaluation of friction coefficient of 38MnVS6 medium carbon micro-alloyed steel in hot forging process by using ring compression test” Technology Letters, Vol. 2, No. 3, pp. 12-16, 2015. Md IsrarEqubal, RajkumarOhdar, Balbir Singh and PinakiTalukdar “Forgeability Study of Medium Carbon Micro-Alloyed Forging Steel” International Journal of Chemical, Nuclear, Materials and Metallurgical Engineering Vol. 9, No. 3, pp. 391-395, 2015. Thermo Acoustic Refregeration, Mechanical Charecterization of Human Hair Reinforced Polyester Composites, Fabrication and Testing of Glass fiber Filament Wound Tubes. M.Sandeep Kumar, D.V.S Raju, C.Udaya Kiran, “Design and stress analysis of Gas Turbine Multi-Stage Rotor Assembly”, International Journal ofInnovative Research in Technology, Vol.1,Issue.5, PP.118-122. B.Sridhar, Y VijayaKumar, C.Udaya Kiran,“Design and Analysis of Masthead for a Twin Boom Stacker”, International Journal ofInnovative Research in Technology, Vol.1, Issue.5, pp.123-127. "Mechanical characterization of hybrid composites: A review", N Kistaiah,C Udaya Kiran,G Ramachandra Reddy,M Sreenivasa Rao,Journal of Reinforced Plastics and Composites, July 2014; vol. 33, 14: pp. 1364-1372, 2014. A Paper with title “Structure, Morphology & Infrared Spectroscopic Characterization of Ga(2x+2) N Fe2(49-x) O3 Ferrite synthesized using Sol Gel technique”, I.Rajani,C.Udaya Kiran,Bhrahmaji Rao is communicated to Journal of Nanoengineering and Nanosystems whose status is under peer review. G.Gopala Krishna, P.Ram Reddy and M.Manzoor Hussain, “Hardness and Tensile Behavior of Friction Stir Welded Aluminum AA6351 Alloy ”, Journal of Mechanical Engineering, Transaction of Mechanical Engineering Division, The Institution of Engineers, Bangladesh, June 2014, Vol. ME 44, No.1, pp.23-26. 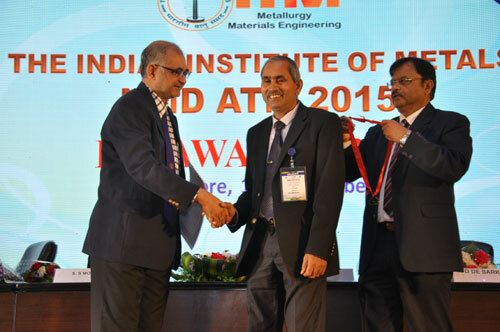 G.Gopala Krishna, P.Ram Reddy and M.Manzoor Hussain, “Mechanical Behaviour of Friction Stir Welding Joints of Aluminium Alloy of AA6351 with AA6351 and AA6351 with AA5083 ”, International Journal of Engineering Trends and Technology (IJETT), Apr. 2014, vol. 10, no. 4, pp. 168 - 172. 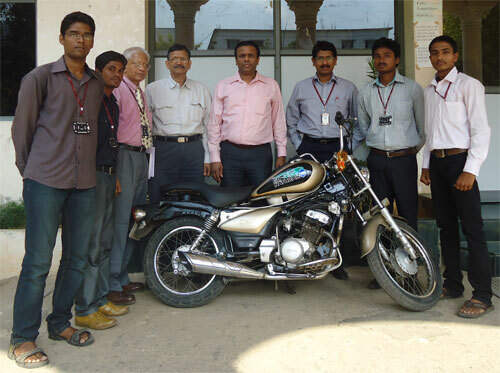 P.H.V.Sesha Talpa Sai, Y. Vijay Kumar, C.Udayakiran, Design of Hybrid Suspension System for Automotive Applications P.Nagaraju*, IOSR Journal of Mechanical and Civil Engineering (IOSR-JMCE),Volume 11, Issue 6 Ver. V (Nov- Dec. 2014), PP 17-21. 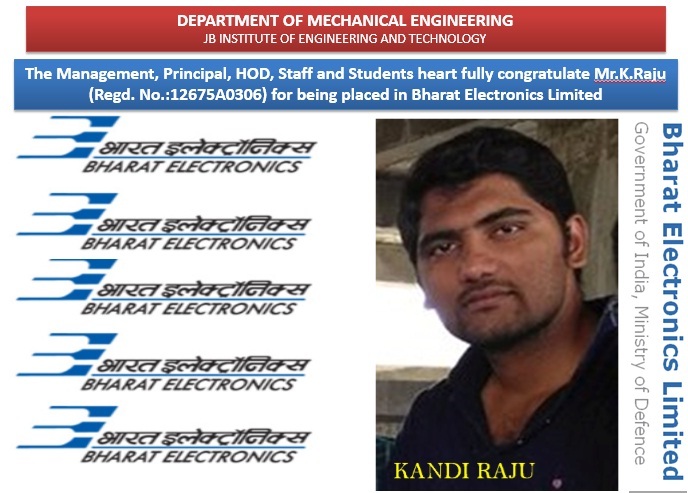 B.Sandhya Rani*, P.H.V.Sesha Talpa Sai, Y. Vijay Kumar, C.Udayakiran, Structural Design and Analysis of Trailer System for Photo Voltaic Cells B.Sandhya Rani*, P.H.V.Sesha Talpa Sai, Y. Vijay Kumar, C.Udayakiran, IOSR Journal of Mechanical and Civil Engineering (IOSR-JMCE), Volume 11, Issue 6 Ver. V (Nov- Dec. 2014), PP 22-25. 12. Sridhara Reddy, Maheswar Dutta and K.Vijaya Kumar Reddy, “The effect of compression ratios on performance and emissions of a diesel-CNG dual fuel engine with hydrogen addition” Accepted for publication in December 2014 issue of Journal of Mechanical Engineering (ISSN: 0379-4318), The Institution of Engineers, Bangladesh (Ref: JME1407147). I.Rajani, Dr.C.Udaya Kiran, Dr.V.Brahmaji Rao;International Conference on Smart Syatems,(ICSS- 7&8 October 2013),Joginpally Bhaskar Rao Institute of Engineering and Technology,Hyderabd, “Review on usage of III-V semi-conducting materials in Nano composites”. I.Rajani, Dr.C.Udaya KIran, Dr.V.Brahmaji Rao; National Conference on Nanotechnology’s Invisible threat:Small science,Big Consequences ,(26-27 September-2013),Mahatma Gandhi National Institute of Research and Social Action (MGNIRSA),”Review on Usage of II-VI Semi-Conducting Nanomaterials”. 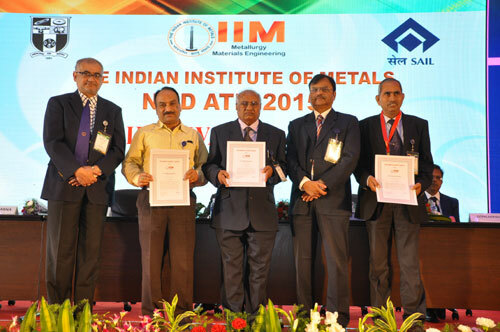 Mr.N.Kistaiah,B.Srinivas,Dr.C.UdayaKiran,,Dr.M.Sreenivasa Rao, A Study On Mechanical Testings Of Hybrid Composites , Volume-1,International Conference On Emerging Trends In Mechanical Engineering, 24-25, February 2014. 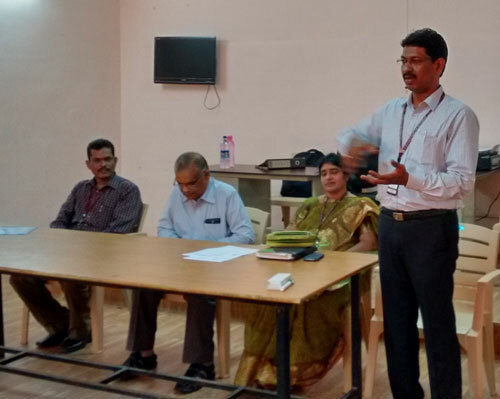 “Role of Good Governance in Human Development in India – Issues & Challenges” in ICSS conducted by Department of ECE and R&D, on 19st & 20th December, 2013. 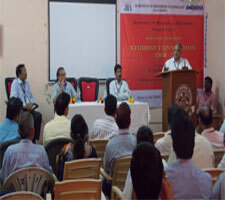 “Recent Trends and Future Potential of Animal Fiber Reinforced Composite Materials” in International conference on Engineering Materials and Processes (ICEMAP-2013), 23rd and 24th May-2013, conducted by Tagore Engineering College, Chennai, Tamilnadu. “Work- Life Balance of Women Entrepreneurs in India” in edited volume Titled “Managing Human Resources in Global Era- Prospects & Challenges, ISBN: 978-81-926819-3-1, page, 158 published in 2014. Design of Air Condition & Distribution Systems, P.DivakaraRao, KrishnamRaju, V.Sreenivasulu, K.Santos, 2nd International Conference on Materials Processing and Charecterization,organized by GRIET, 16-17 March 2013. Design of Centrifugal Pump for Palm Fruit Pulp Handling in Palm Oil Plant, V.Sreenivasulu, P.Divakara Rao,Anoopkumar, B.D.G.N.Kumar, 2nd International Conference on Materials Processing and Charecterization,organized by GRIET, 16-17 March 2013. Reduction of Ream Packing Machine Engineering Downtime by 50% from Current Level, P.DivakaraRao, B.V.K.Murthy, V.Sreenivasulu, M.Kishore, 2nd International Conference on Materials Processing and Charecterization,organized by GRIET, 16-17 March 2013. Design of Centralized Oil Lubrication for Writing & Printing Paper Plant, P.DivakaraRao, Y.Vijaya Kumar, V.Sreenivasulu, G.V.SubbaRao, 2nd International Conference on Materials Processing and Charecterization,organized by GRIET, 16-17 March 2013. Design of Centrifugal Pump for Pulp Handling in Paper Plan, D.V.S.Raju, Y.Vijayakumar, V.Sreenivasulu, G.NageshwaraRao, 2nd International Conference on Materials Processing and Charecterization,organized by GRIET, 16-17 March 2013. Analysis of Interfacial microstructure of post weld heat treated dissimilar metal weld of type 316 LN/C-Steel Joint, K.Jitendar Reddy, Sujith Satyam, G.Gopala Krishna, Sreedhara Reddy, Proceedings of the National Conference on Advances in Merchnicala Engineering and Renewable Energy(AMERE-2013), 25-26 March 2013. 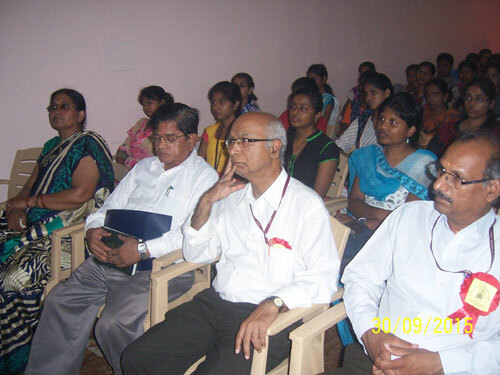 Work- Life Balance of Women Entrepreneurs in India, B.Uma Rani, P.Divakara Rao, National Seminar conducted by Department of Commerce & Management, Osmania University on “Modern Management Practices” on 1st & 2nd February, 2013. Sridhara Reddy, Dr.Maheswar Dutta, Dr. K.Vijaya Kumar Reddy, “Experimental investigation of spark ignition engine operating on different Hydrogen–CNG blends”, International journal of computer applications in Engineering, technology and sciences (IJ-CA-ETS), April-Sept 2013, volume 5, issue 2 pp. 77-85. Sridhara Reddy, Maheswar Dutta, “Performance and Emission Characteristics of Direct Injection CNG-Diesel Dual Fuel Engine”, IOSR Journal of Mechanical and Civil Engineering (IOSR-JMCE) Vol. 8, Issue 5 (Sep. - Oct. 2013), pp 29-37. Sridhara Reddy, MaheswarDutta and K.Vijaya Kumar Reddy, “An experimental study on the effect of exhaust gas recirculation on operating parameters of diesel-cng dual fuel engine with hydrogen addition”, International Journal of Emerging Techniologies and applications in Engineering Technology and Scxiences (IJ-ETA-ETS), Jan ’14 – June ’14, volume 7 : Issue 1 pp 16-022. L.Sudheer, G.Gopala Krishna and Dr.C.Udaya Kiran, “Modelling and FEM analysis of Single Arm Robot”, International Journal of Innovative Technologies, Nov. 2013, vol. 01, issue 06, pp. 557-561. G.Gopala Krishna, P.Ram Reddy and Manzoor Hussain, “Experimental Investigation of Tensile Strength and Deflection Characteristics Friction Stir Welded Aluminum AA 6351 Alloy Joint”, Accepted for the publication in IOSR (International Organization of Scientific Journal)Journal of Mechanical and Civil Engineering (IOSR-JMCE), (The article ID : C33036 ) for the May –June 2013 issue (e-ISSN: 2278-1684,p-ISSN: 2320-334X, Volume 7, Issue 1). India, during 27th – 28th February 2013. Sridhara Reddy, MaheswarDutta and K.Vijaya Kumar Reddy, “A Comparative Evaluation of the Performance and Emission Characteristics of Internal Combustion Engine with Compressed Natural Gas as Alternative Fuel”, International Journal of Emerging Technology and Advanced Engineering (IJETAE), Vol.3, issue 10, October 2013. “Review on Recent trends in the usage of Nano materials in Nano composites and their applications”, I.Rajani, C.UdayaKiran, V.BrahamajiRao, International Conference in Materials Processing and Characterization,1, 2012. Modeling And Analysis Of Fork Lift, T.Glory, Y.Vijaya Kumar, V.Sreenivasulu,P.Diwakara Rao, RITS ICAEM-2013: 2nd International Conference on Advancements in Engineering and Management,RITS,27 & 28 February 2013, 332-338. Modelling And Analysis Of 4-Stroke Petrol Engine Crank Shaft, Mohammed Faisal, Y.Vijaya Kumar, V.Sreenivasulu, P.Diwakara Rao, RITS ICAEM-2013: 2nd International Conference on Advancements in Engineering and Management,RITS,27 & 28 February 2013, 337-339. 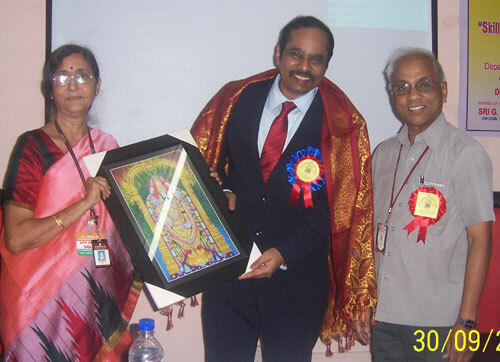 “Introduction, Synthesis, properties and Applications of Carbon Nanotubes”, I.Rajani, C.Udaya Kiran, National Conference on “Nano-biotechnology: Emerging Trends and Applications in Microbiology” organized by Mahatma Gandhi National Institute of Research and Social Action (MGNIRSA), Hyderabad from 4th -6th February 2011. Torsional Vibration Analysis of Pre-Twisted Cantilever Beam, using FEA, P.Naveen kishore, G.Gopala krishna , P.Diwakara Rao, V.Sreenivasulu, RITS ICAEM-2013: 2nd International Conference on Advancements in Engineering and Management,RITS,27 & 28 February 2013, 340-344. Reduce Internal Rejection In Ic Engine Vaive Using Six Sigma Method M.Manikyala Rao, V.Sreenivasulu, P.Diwakara Rao, C.Udaya Kiran, RITS ICAEM-2013: 2nd International Conference on Advancements in Engineering and Management,RITS,27 & 28 February 2013, 345-348. Finite Element Modeling For Maximum Temperature In Friction Stir Welding And It’s Validation Samala Raju, P. Ravikanth Raju, P.Diwakara Rao, V.Sreenivasulu, RITS ICAEM-2013: 2nd International Conference on Advancements in Engineering and Management,RITS,27 & 28 February 2013, 349-353. Finite Element Analysis Of Vibration Fixture Made Of Aluminum And Magnesium Alloys G. Phani sowjanya, P.Diwakara Rao, V.Sreenivasulu, C.Udaya Kiran, RITS ICAEM-2013: 2nd International Conference on Advancements in Engineering and Management,RITS,27 & 28 February 2013, 354-357. Thermal Analysis Of Functionally Graded Plates Using Higher Order Theories A. Kiran Kumar, C.Udaya Kiran, V.Sreenivasulu, P.Diwakara Rao, RITS ICAEM-2013: 2nd International Conference on Advancements in Engineering and Management, RITS,27 & 28 February 2013, 358-364. Analysis of Composite Drive Shaft, L. Venu Varma1, P. Srinivasa Kumar, P.Diwakara Rao, V.Sreenivasulu4, RITS ICAEM-2013: 2nd International Conference on Advancements in Engineering and Management,RITS,27 & 28 February 2013,365-369. Stress Analysis On A Crankshaft For Dynamic Load, R. Bhushana Rao , B V K Murthy , D.M.Lal, K.Jithendar Reddy, RITS ICAEM-2013: 2nd International Conference on Advancements in Engineering and Management,RITS,27 & 28 February 2013, 419-426. Finite Element Analysis of Vibration Fixture Made of Aluminum and Magnesium Alloys, G. Phani Sowjanya, P. Divakara Rao, Dr. C.Udaya Kiran,Volume 2, Issue 1, IJLTET. Modelling and Stress Analysis of Flare Piping, T.V.V.Satyanarayana, V. sreenivasulu, Dr.C.Udaya kiran,Volume 2, Issue 1, IJLTET. Centralized Oil Lubrication System, N.Ashok kumar,P.Divakara Rao, V. sreenivasulu, Dr.C.Udaya Kiran,Volume 2, Issue 1, IJLTET. Performance and Emission Comparisions of a retrofitted spark Ingnition Scooter Engine filled with Gasoline and CNG, Sreedhara Reddy, Maheshwara Dutta, Proceedings of National conference on Recent Advances in Mechanical Engineering and their impact on Indian Industries (RAMEIII-2012), 20-22September-2012. “Recent Trends and Future Potential of Natural Fiber Reinforced Composite Materials”, P.Divakara Rao, V.Sreenivasulu, C.Udaya Kiran, K.Eshwara Prasad, National conference on Recent Advances in Mechanical Engineering and their impact on Indian Industries (RAMEIII-2012), 20-22September-2012. Experimental Investigation of friction stir weldiong of aluminium 1080 Alloy joint testing for Aircraft structures, G.Gopala Krishna, M.Manzoor Hussain, P.Ramireddy and Lingamurthy, Proceedings of 1st comference on computing communications, systems and Aeromatics(ICCCSA 2012), 30-31 March 2012. Experimental Investigation of friction stir weldiong of Aluminium AA6061, All Joints testing for Aircraft structures, G.Gopala Krishna, M.Manzoor Hussain, P.Ramireddy and Lingamurthy, Proceedings of National conference on Recent Advances in Mechanical Engineering and their impact on Indian Industries (RAMEIII-2012), 20-22September-2012. 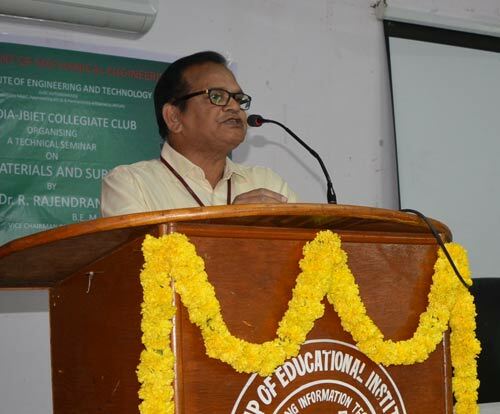 Presented a paper titled “Traits of Women as Successful Entrepreneurs –An Indian Perspective”, , B.Uma Rani, P.Divakara Rao, National Conference on Women Empowerment & Entrepreneurship conducted by Tolani College of Commerce, Mumbai on 24th November, 2012. 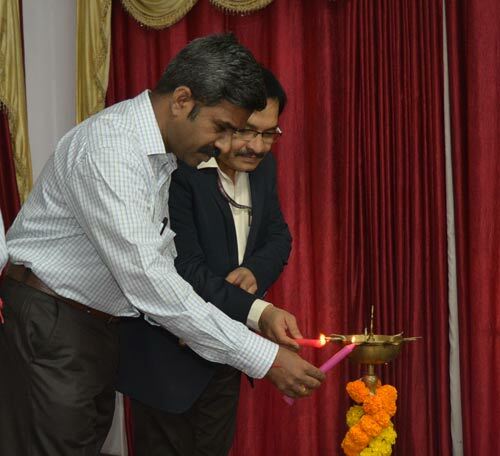 I.Rajani,Dr.C.Udaya KIran,Dr.V.Brahmaji Rao;International Conference on Smart Syatems,(ICSS- 7&8 October 2013),Joginpally Bhaskar Rao Institute of Engineering and Technology,Hyderabd, “Review on usage of III-V semi-conducting materials in Nano composites”. I.Rajani,Dr.C.Udaya KIran,Dr.V.Brahmaji Rao; National Conference on Nanotechnology’s Invisible threat:Small science,Big Consequences ,(26-27 September-2013),Mahatma Gandhi National Institute of Research and Social Action (MGNIRSA),”Review on Usage of II-VI Semi-Conducting Nanomaterials”. 20 Students have participated in different events and won first prize in light weight mobility vehicle at SAE student convention 2017, Tyre-3 event from 25-02-2017 to 26-02-2017 at Kongu University at Erode,Tamilnadu. Five students have participated and qualified the virtuals in Baja Virtuals on 14 and 15 July 2017 at Chitkara University. 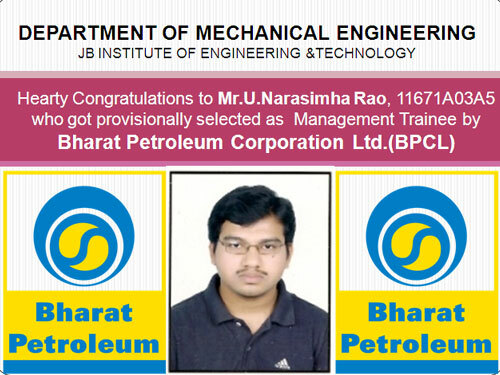 Hearty Congratulations to Mr.U.Narasimha Rao, 11671A03A5 who got provisionally selected as Management Trainee by Bharat Petroleum Corporation Ltd.(BPCL). Thirteen students of II and III B.Tech Mechanical Engineering have attended TIER III Convention of SAE hosted by Kalasalingam University, Krishnankoil, Virudhunagar District Tamilnadu held during 30th & 31st January 2015. Students have bagged II Prize for their “Club Presentation” event and appreciattion to JBIET SAE Collegiate Club for hosting TIER II Events at JB Institute of Engineering & Technology. 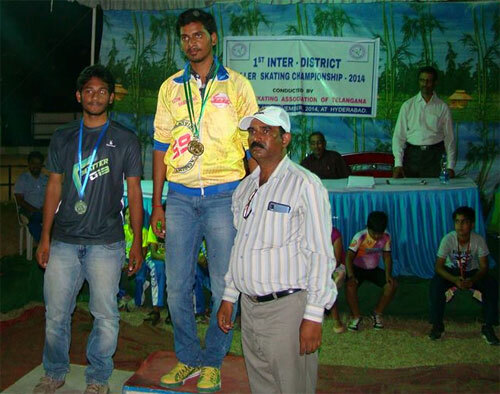 Mr.R.Vikas Kumar Singh of III B.Tech Mechanical Engineering has participated and bagged Two Gold Medals and one Silver Medals in the Inter District Roller Skating Championship-2014 held during 7-10 Nov 2014 at Indira Park, Hyderabad. Ms.Apurva and Mr.Srikanth Reddy of IV B.tech have bagged a cheque of Rs.5000/- and Certificate of Appreciation for their merit in ENGINEERIA’14, an Engineering Quiz Compitition conducted by CADD Center Training services Pvt. Ltd., during Aug to Sep 2014. 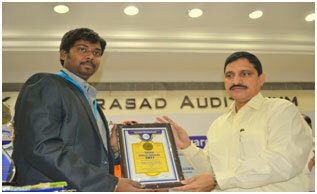 Mr.Raghuvamsh, a Mechanical Engineering student of 2008-2011 batch is awarded with prestigious “SUJANA GOLD MEDAL 2011” on 4th April 2012. 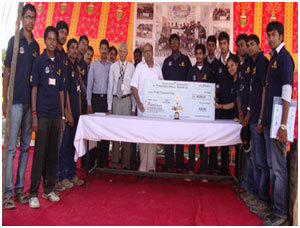 Mechanical Engineering students who won 1st prize for their project at TECHNO FEAST 2011, held by JNTUH. 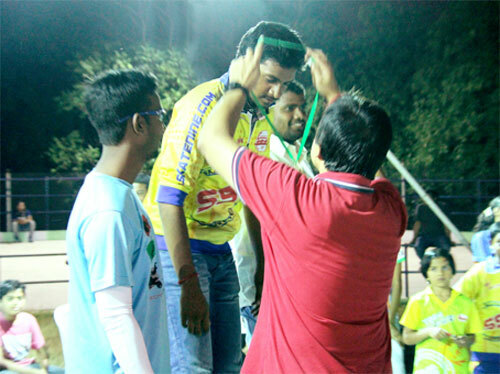 "SAE INDIA JBIET Collegiate Club" being awarded with best Collegiate Club for the year 2011 from southern Section of India. 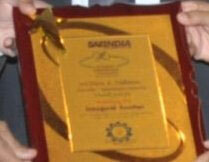 Award was received on 1 Oct 2011. 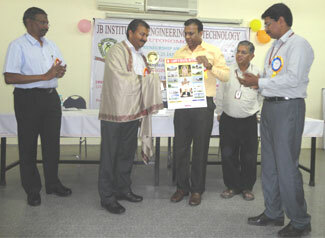 A project with title “Extraction of water from Atmospheric Air” has bagged 1st prize at project presentation competition at TECHNOFEST 2011 conducted by JNTUH during the academic year 2010-11. 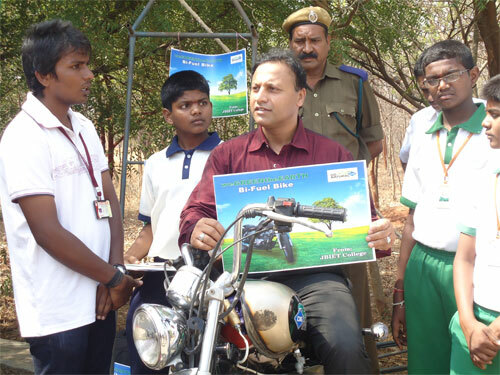 A team of students of our department have designed Effi-Cycle and their design is selected for the competition at SAE competitions which will be held at Chennai during Nov 2011. A group of students of the department have designed, fabricated a four wheeled all terrain vehicle and participated in the SAE BAJA competition at Pithampur. 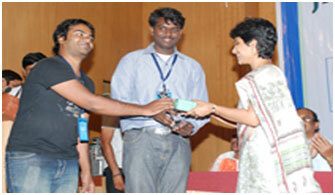 They have bagged II prize with cash prize of Rs.50,000/- for their technical presentation. 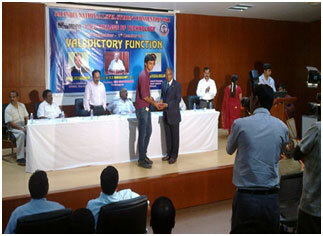 Mr. Bhasker Ranjith of IV B.Tech is selected for Scholarship award by SAE and is presented at the meet conducted by SAE at Chennai during 30 Sep-1 Oct, 2011. Elected for Best SAE Collegiate Club of INDIA, Southern Section and our students have received this award at Chennai during the meet conducted by SAE during 30 Sep-1 Oct, 2011. SAE BAJA team on behalf of Department of Mechanical Engineering has participated in the "Effi-Cycle" Race conducted by Preseteious SAE at Chandigarh during 14-16 Oct 2011.